We've discovered a huge market for Tea Pot sets! We have trouble keeping them in stock for longer than a week! Beautiful and Unique Bavarian Children's Service for 10. Perfect condition, Sold in 3 hours! Czechoslovakian Adult Service for 5, regular size. Depicts the 1865 famous "The Bartered Bride" Opera. Sold in 1 hour!!! 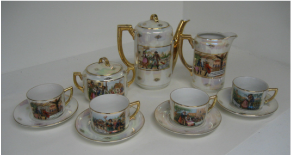 Amazing German Children's Tea and Dinnerware service for 5. Very dainty and thin porcelain. Sold for $150 in 3 days. 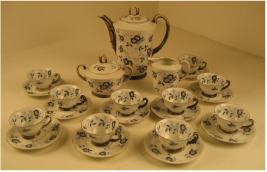 Contact form for Tea Pot Set notifications! Let us know if you have a certain color, design, country origin, size of service, etc. that you are looking for. Are you looking for a regular set or a children's set? 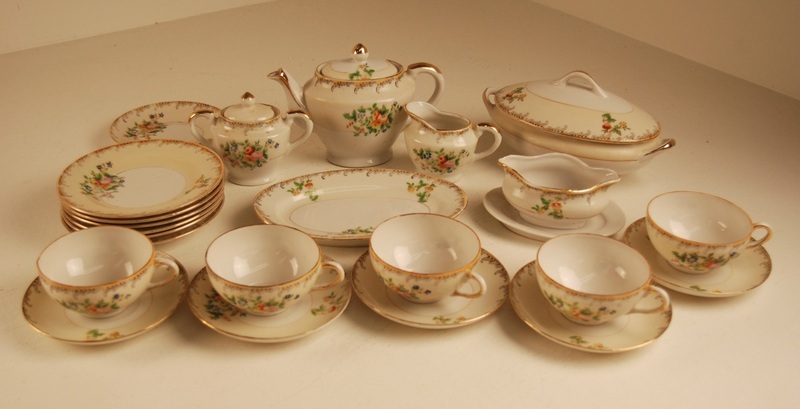 25 Piece Children's Beautiful Floral Lusterware Tea Pot and Dinnerware Set! In perfect condition with no chips, cracks, crazing, or scratches! Be the first to see our new stock! When we get a set in, we'll let you know, give you all the details and send pictures too!